The Grey Magician with a Porcelain Beard?? Picked up another couple of titles over the past couple of days. The Porcelain Magician by Frank Owen and Brian Aldiss’ Greybeard. The acquisition of The Porcelain Magician is significant as it brings my GP collection up to the 75% mark. Expect a Progress Report when it arrives. Greybeard is just another Aldiss first edition to add to the library. This is a departure from the norm as this is the first ‘official’ Close Up I’ve done for a non GP book. This blog contains a couple of pseudo-Close Ups of some Gene Wolfe’s books, but none conform to the regular GP template. So, as one of my favorite short story collections, I have always wanted a first edition of The Saliva Tree. I picked this up off eBay for a reasonable – though not bargain – price compared to others I’ve seen around the ‘net. This copy has some special provenance which I’ll outline later. It’s in pretty good condition, so let’s have a closer look. The cover and, importantly the spine, are bright and exhibit no fading. Two things to note on the cover are a sort of a graze mark that has deposited some dark substance upon the top right of the cover and a 1cm closed tear to the bottom edge. The cover art by Charles Mozley is interesting. 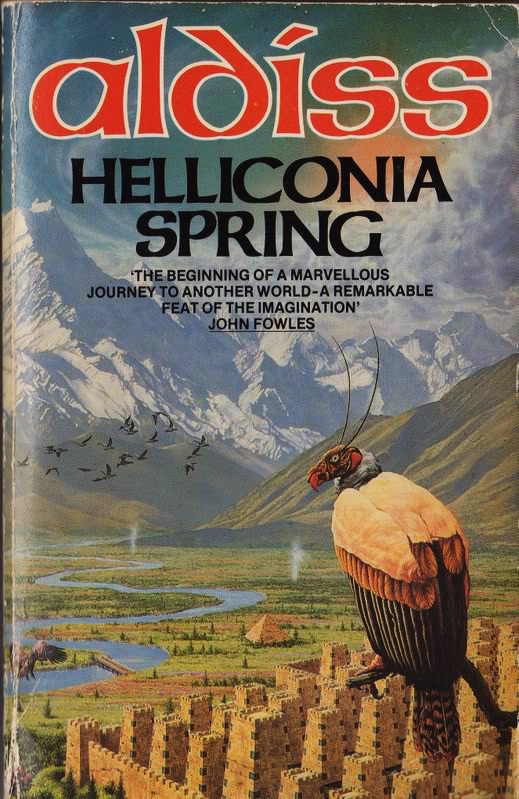 Depicting a scene from the title short story (1965 Nebula Award winning novella, actually..) seems to be at odds with what was the normal SF cover art around that time, though it fits very well with that particular tale. There is a nice little bio about Mr Mozley at the University of Reading here. Nice cloth in perfect condition. The top and bottom views reveal nothing we haven’t seen already. It looks very nice. There’s a little wear to the head and tail of the spine, but nothing really noteworthy or damaging. The back of the jacket looks good except for a slight score just to the left of Best Fantasy Stories, and some staining across the blurb for Earthworks. I mentioned some provenance earlier. This copy was a complimentary issue, issued about three weeks prior to publication to one Ritchie Calder – then president of the H.G. Wells society. We see in the laid in letter how The Saliva Tree ties into the association with H.G.Wells. Also (if you’ve read it..), how the cover art relates very well to this association and the title story. Binding: Currey priority ‘A’- Dark green cloth with gold lettering on spine. Chalker & Owings: Absent. Chalker and Owings only references independant/specialty publishers. Faber and Faber are neither. Currey: THE SALIVA TREE AND OTHER STRANGE GROWTHS. 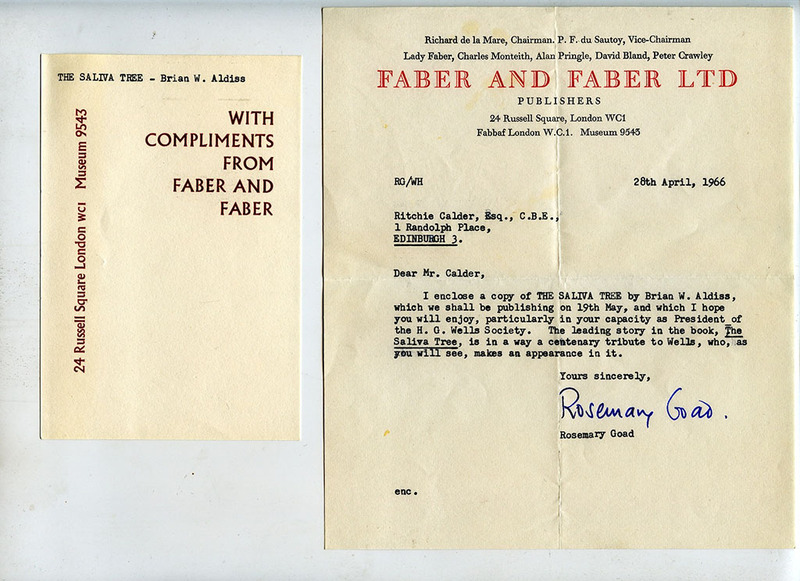 London: Faber and Faber, . Two bindings, priority as listed: (A) Dark green cloth, spine lettered in gold; (B) Dark green boards, spine lettered in gold. First published in mcmlxvi on copyright page. Comments: I’m proud to have this. It’s one of my favorite collections from one of my favorite authors. Extra special is the provenance as I mentioned. It’s a great collection!! Highly recommended reading.